We’re 6 weeks away from opening night and things are really starting to tighten up with the cast of Hope High: Class of ’84. Last Sunday, we had an all-cast rehearsal so we could see how we’re looking as far as the timing of the show and everyone’s performance. If I do say so myself, we’re looking pretty good! Sharece has introduced a new theater technique to the teens by working on Levels of Tension, a form of Neutral Mask Training. This exercise is about stage presence and showing emotion. This is an exercise done many different ways and called many different things, but the end result is the same. There are 7 levels, or stages, starting with Asleep, where there is no tension in the body and moving or speaking is a real effort. The exercise ends with Stage 7 which is Frozen, the height of tension where emotions are so high that you’re almost literally frozen and petrified by them. The exercise is complex and will take some more time for everyone to feel truly comfortable with it, but I can already see the cast responding positively to this. It’s given the teens a point of reference to call back to while working on a scene. 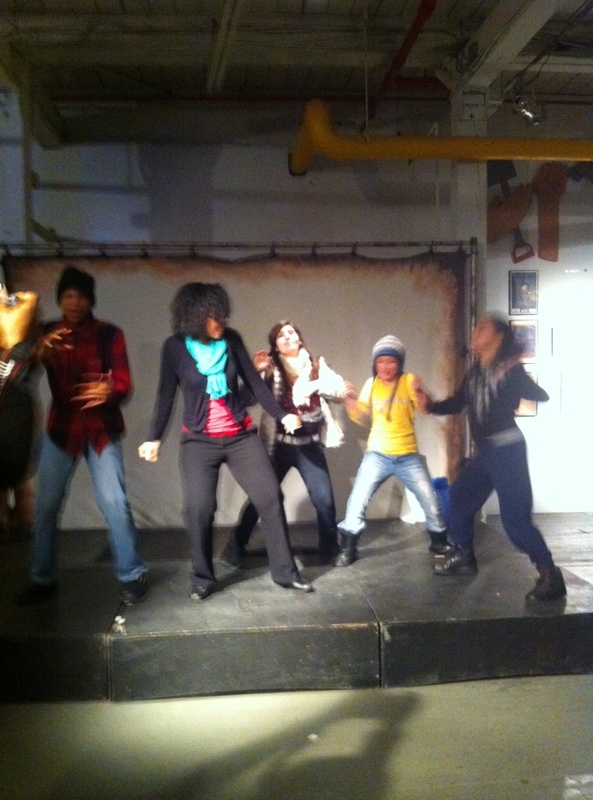 Director Sharece Sellem Harlem Shakes off some tension with the rest of the cast. I think we’ve given the cast so many exercises over the course of our rehearsals that they don’t always understand. I’ve taken acting classes at different points of my life since I was in middle school and some of these things get a little…weird. I remember starting each class pretending to be a bee that moos like a cow in 8th grade, or reciting tongue twisters ad nauseum before rehearsals in 10th grade, elaborate stretches where we identify each others’ vertebrae in a college acting class. I often wondered, “what the heck does this have to do with our play?” I never want our cast to feel that way, so Sharece and I do our best to explain why we have them do certain things. They all enhance your presence on stage or provide more training as an actor. Seeing the cast perform after going over the Levels of Tension was like seeing a light switch go off in their heads. Their performances were kicked up about ten notches and they were so much more comfortable on stage. We didn’t even have to explain the “point” of this exercise because it was clear that they got it. Another piece of the puzzle is coming together!